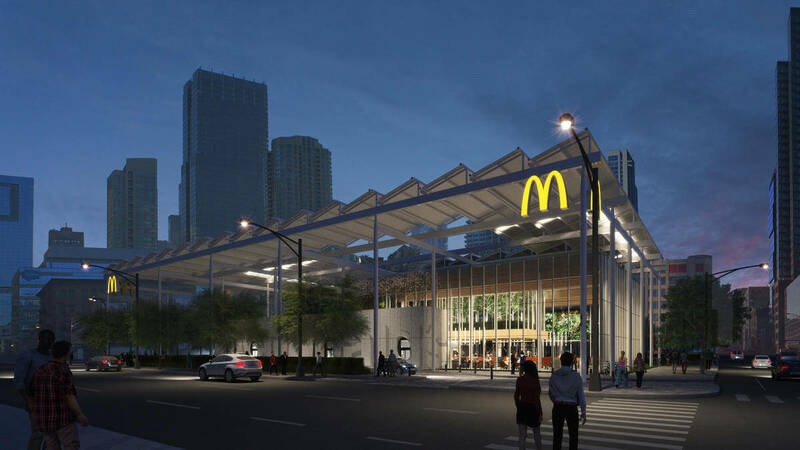 Carol Ross Barney, the Chicago architect behind the city's acclaimed Riverwalk, is now tackling a totally different project: a flagship McDonald’s in River North. 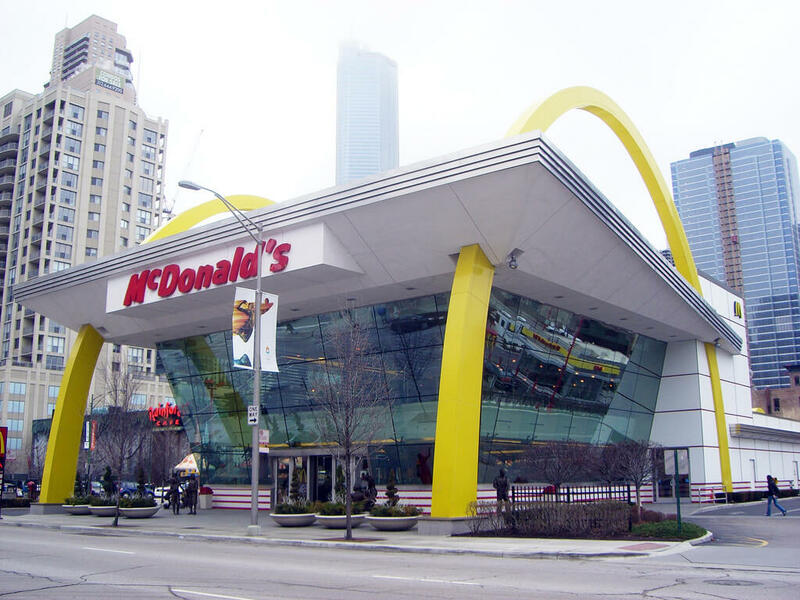 The glass, steel, and timber structure will replace the just-demolished Rock 'N' Roll McDonald's on the same site. At 19,000 square feet and one story, it's about 20 percent smaller and a floor shorter than its beloved predecessor, which was famous for its giant double arches and on-site memorabilia museum. 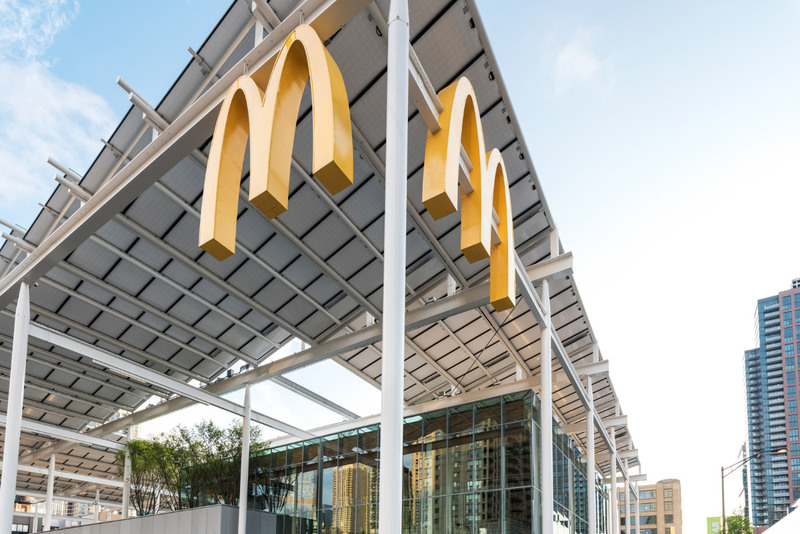 While the Rock 'N' Roll McDonald's featured a two-lane drive-thru and ample parking, the new McD's welcomes pedestrians into burger heaven with a grassy outdoor plaza shaded by 70 trees and a sawtooth canopy reminiscent of a fancy truck stop. Inside, ferns and white birch trees will float in a ring of glass above customers as they place their orders, and diners can crush Big Macs beneath a living wall. The kitchen, which is the only part of the McDonald's left over from the old building, will be planted with apple trees. Although customers will still be using plastic utensils to eat out of disposable containers, the building will be energy-efficient. 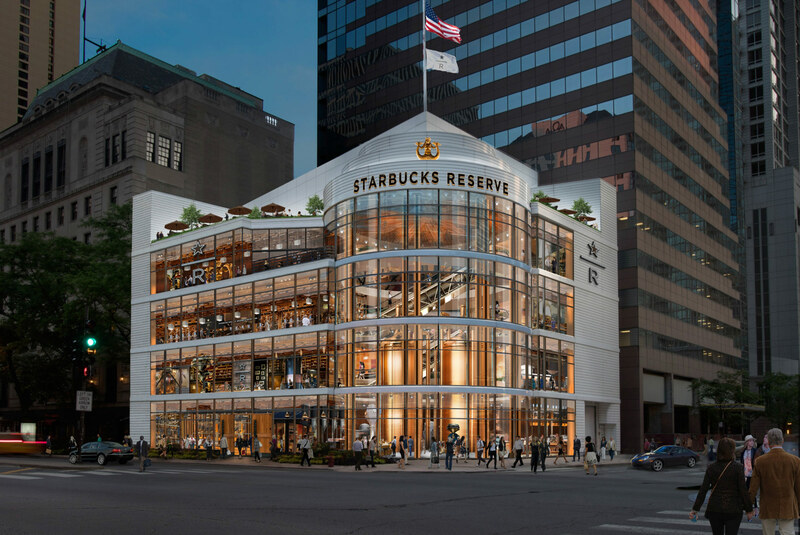 Its roof will sport solar panels, and Barney's firm is designing the HVAC system, as well as the all-important fryers, to use less non-renewable energy. “It’s so interesting to work on a project like this because you’re designing for an icon,” Barney told the Chicago Tribune, which first reported the story. The redesign is part of McDonald’s corporate rebranding that emphasizes sleekness over kitsch. The company, not the franchise owner, is paying for most of the new building, part of a $2.4 billion investment campaign that's mostly focused on changing the customer experience in its U.S. restaurants through 2020. This year, 4,000 outlets in the state will be renovated to include new-ish devices like self-order kiosks, plus new service options like delivery and curbside pickup. Tobias Wong, the so-called "bad boy" of design, has his first solo show at SFMOMA. The honor comes posthumously, as Wong died in 2010 at the age of 35. Henry Urbach, SFMOMA’s Helen Hilton Raiser Curator of Architecture and Design, developed the exhibit, which features over 30 works by the late artist/designer. Wong’s designs, which he commonly referred to as “postinteresting” and “paraconceptual,” often played with the subversion of today’s consumer culture and the obsession with wealth and the toys that often accompany it, as well as post-9/11 American anxiety and its material manifestations. 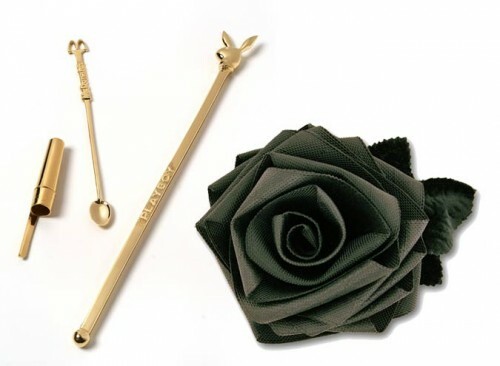 Wong also took pleasure in appropriating, some would say misappropriating, the works of others, which resulted in his being labeled a provocateur, ruffling the feathers of even large corporations like McDonald’s, who wasn’t thrilled with Wong’s gold plated version of its coffee stirrer (above).